Categories: Katauta, Photos, Poetry | Tags: CARPE DIEM HAIKU KAI, Photos, Poetry | Permalink. Spectacular image… the words a bright illumination. Lovely. I like the arrow image! Thank you! I shopped it in using > signs over a picture I took of the full moon. the best among the links ! I fell in love with the second one ! The best among the group ! I fell in love with the second one instantly ! How stunning! What wonderful timing you had to get this shot. Thank you for sharing this image with us. And your beautiful accompanying poem too! Thank you! I only wish I could have such lucky timing so I have to confess, timing had nothing to do with it. 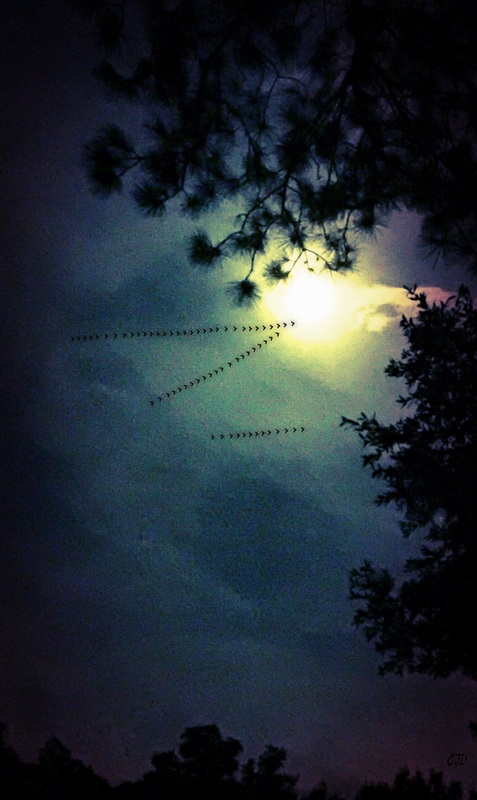 I took the moon photo, tinted it to look like dusk and then added the geese by inserting > signs in a row. Yes, I’m a big fat cheater but I managed to match the image in my head. So it is more my artistic rendering than a pure photo. Now I am impressed by your skill to pull that off. Well done for imagining and then actually creating it! Whew, I was afraid you might “unfollow” once you found out I was a CHEATER. So thank you. To be honest, I used to be a big proponent of “pure” photos and I admire those that do it. I decided that for me, whatever visual medium supports the emotion I am trying to portray is an acceptable goal.